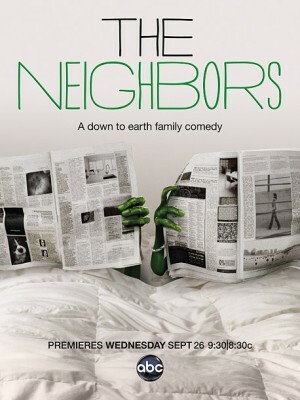 It’s got a crazy premise but The Neighbors has a great timeslot. Will it be cancelled because of low ratings or could it actually survive to see a second season? We shall see. The first season of The Neighbors typically airs Wednesday nights at 8:30pm on the ABC network. The sitcom’s cast includes Lenny Venito, Jami Gertz, Clara Mamet, Max Charles, Isabella Cramp, Simon Templeman, Toks Olagundoye, Ian Patrick, and Tim Jo. Below are the TV show’s ratings for the 2012-13 season, the best way to tell if The Neighbors is going to be cancelled or renewed for a second season. UPDATE: It was initially reported that ABC had renewed this show but the series’ fate now looks uncertain. Final season averages: 1.9 rating in the 18-49 demographic with 6.19 million total viewers. 1.5 in the demo (+7% change) with 5.52 million (+16% change). Season averages: 1.86 in the demo with 6.19 million. 1.4 in the demo (0% change) with 4.76 million (+1% change). Season averages: 1.88 in the demo with 6.22 million. 1.4 in the demo (-18% change) with 4.72 million (-18% change). Season averages: 1.90 in the demo with 6.29 million. 1.7 in the demo (0% change) with 5.74 million (-5% change). Season averages: 1.93 in the demo with 6.38 million. 1.7 in the demo (-11% change) with 6.01 million (-5% change). Season averages: 1.94 in the demo with 6.41 million. 1.9 in the demo (+12% change) with 6.34 million (+8% change). Season averages: 1.95 in the demo with 6.44 million. 1.7 in the demo (0% change) with 5.89 million (-3% change). Season averages: 1.96 in the demo with 6.44 million. 1.7 in the demo (+6% change) with 6.04 million (+15% change). Season averages: 1.97 in the demo with 6.48 million. 1.6 in the demo (-20% change) with 5.27 million (-18% change). Season averages: 1.99 in the demo with 6.51 million. 2.0 in the demo (+11% change) with 6.42 million (+5% change). Season averages: 2.02 in the demo with 6.61 million. 1.8 in the demo (-14% change) with 6.09 million (-8% change). Season averages: 2.02 in the demo with 6.62 million. 2.1 in the demo (+31% change) with 6.65 million (+23% change). Season averages: 2.05 in the demo with 6.67 million. 1.6 in the demo (-16% change) with 5.40 million (-16% change). Season averages: 2.04 in the demo with 6.67 million. 1.9 in the demo (0% change) with 6.42 million (-6% change). Season averages: 2.09 in the demo with 6.81 million. 1.9 in the demo (-10% change) with 6.82 million (-1% change). Season averages: 2.11 in the demo with 6.86 million. 2.1 in the demo (+11% change) with 6.87 million (+19% change). Season averages: 2.14 in the demo with 6.87 million. 1.9 in the demo (-5% change) with 5.78 million (-17% change). Season averages: 2.15 in the demo with 6.87 million. UPDATE: ABC has ordered a full season of 22 episodes. 2.0 in the demo (+5% change) with 6.96 million (+7% change). Season averages: 2.20 in the demo with 7.08 million. 1.9 in the demo (-5% change) with 6.53 million (+2% change). Season averages: 2.25 in the demo with 7.12 million. 2.0 in the demo (+5% change) with 6.39 million (+1% change). Season averages: 2.37 in the demo with 7.31 million. 1.9 in the demo (-41% change) with 6.32 million (-32% change). Season averages: 2.55 in the demo with 7.77 million. 3.2 rating in the 18-49 demographic with 9.22 million total viewers. Season averages: 3.20 in the demo with 9.22 million. Compared to last season’s premiere of Happy Endings in the same timeslot, the network was up by 6% in the demo (vs a 3.1 rating) and up by 27% in viewership (vs 7.25 million). Overall, The Neighbors did well for ABC but, based on the negative reviews and comments, one has to think that there’s a very good chance the numbers will take a serious nosedive in week two. We shall see. What do you think? Do you like The Neighbors TV series? Do you think it should be cancelled or renewed for a second season? I love this show–everyone loves eachother, they all support one another-no violence-no bullying of the audience–lovely plots that make one feel good when the show is on- and missing the characters when the episode is over.my grandson won’t watch tv anymore after the red wedding of game of thrones and he is 23 years old. THE NEIGHBORS: Quirky, funny, and entertaining. Great characters & premise. Excellent actors. Please focus more on the alien aspects, especially their specifics like changeability & original form? Worthy of being renewed for another season. Maybe you need a companion alien show with different competing/rival races. One more thing, I love cross-overs. How about developing some special effects with that–something mind-blowing. LOVE LOVE LOVE JUST ABOUT EVERYTHING ON THE ABC!! !…Thanks, Disney. Just starting watching this show July 2013.It seems to be a great family show.Please do not not cancel. This show is magnificent. ABC would be making. a big mistake by cancelling this show. Love this show! It’s one I never miss. It just leaves you feeling good. Please don’t cancel this one, it has some quality. We loved this show!!!!! I will be so sad if it is not renewed! It is the one show each week we could count on for fun!